With the cup firmly at the forefront of Evertonian minds, the Blues need to refocus on Premier League action, with Reading in town for a crucial home fixture. However our archive footage this week does not feature a previous visit of Reading. Looking back through our previous meeting with the Royals, there wasn’t really a game that stood out or one that lived long in the memory. In fact the sides have only met 9 times previously and all games have been incredibly tight. 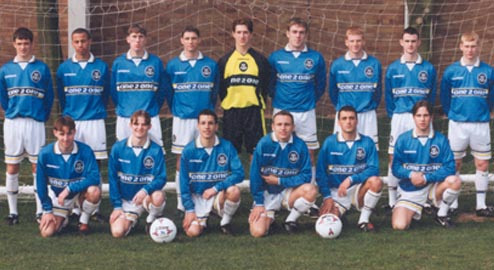 As a result we thought we would celebrate Leon Osman scoring his 50th goal for Everton in the win over Oldham on Tuesday night by going back to 1998 and a very young looking Leon Osman scoring an outstanding goal for the Everton youth team as they secured FA Youth Cup success with a win over Blackburn Rovers. Right then, back to the weekend and the Premier League. With the Champions League a fading dream, Everton must return to winning ways if they are to secure European football for next season through the Premier League. Relegation threatened Reading will provide a tough test and despite having an average record against the Royals, Everton should have too much for the struggling side, especially at Goodison Park. When the two teams met earlier in the season, Everton dominated the first half and but for some poor officiating and finishing in front of goal, would have had the game wrapped up by the time the referee blew for half time. Reading responded well after the break and as Everton retreated into what has become a familiar shell, Adam Le Fondre punished the Blues with two well taken goals. Despite the midweek cup win, David Moyes is unlikely to name an unchanged side with Marouane Fellaini set to return from the slight knee injury that kept him out of Tuesday nights match with Oldham. Phil Neville remains the more likely to drop out, but Moyes may consider other options, if he wishes to retain Neville’s defensive discipline in the midfield. Our likely XI: Howard, Coleman, Baines, Jagielka, Distin, Osman, Gibson, Fellaini, Mirallas, Pienaar, Jelavic.